Not only do these maps looks beautiful, but there is a strong argument that they do a better job of representing data compared to the more common choropleth methods of filling geographical regions with one colour based on one variable. The pièce de résistance of dot-density mapping is that it does not suffer from the tendency of over-emphasising the influence of large, yet sparsely populated areas, as colour-coverage is dictated by count, not area size. When applied to election mapping, this gives a fairer assessment of the ‘popular vote’ when compared to a standard choropleth map that will fill entire constituencies with the colour of the winning party, regardless of how close the contest was or how many people voted. 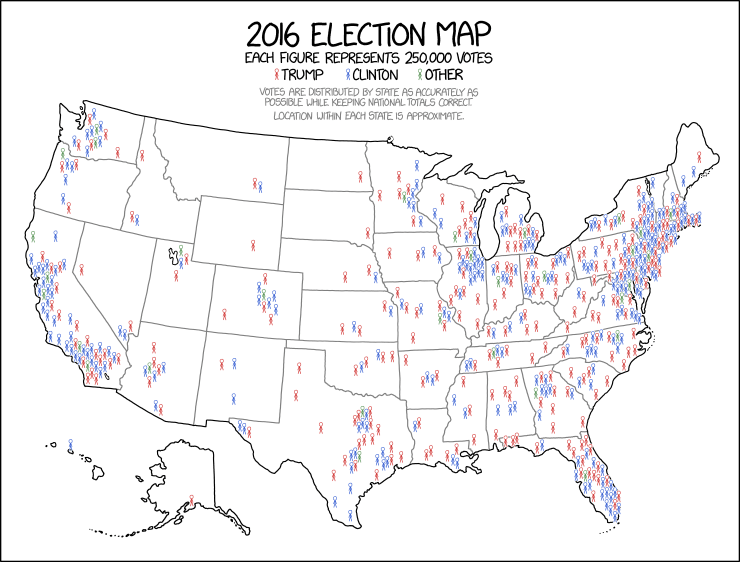 A good example of this is the webcomic xkcd and cartographer Kenneth Field’s recent interpretations of the 2016 US Presidential Election (see images below, respectively), both of which set twitter alight with debate. You can also have a gander at the Mapping tool we built last year to look at UK election results from a dot-density context. And for a more enlightented discussion on the troubles and strifes of accurate mapping, check out the latest FT chart doctor article, where the FT’s Alan Smith talks with professor Mark Monmonier, author of the classic book How to Lie With Maps. (while you’re at it, have a look at Steven Bernard’s piece on how the FT’s always-on-point maps are made here). With all of this in mind, I thought it would be a good time to update the previous blog post, this time utilising the relatively new simple features (sf) R package. sf makes it a lot easier to do geospatial analysis within a tidy framework, ergo making it work seamlessly with the tidyverse, as each geospatial element is bundled into a list and treated as a single observation of a geographic variable in a data frame. No more fortifying malarky. First lets get some election data and a constituency level shapefile then select/rename the columns we need in each and join them together. 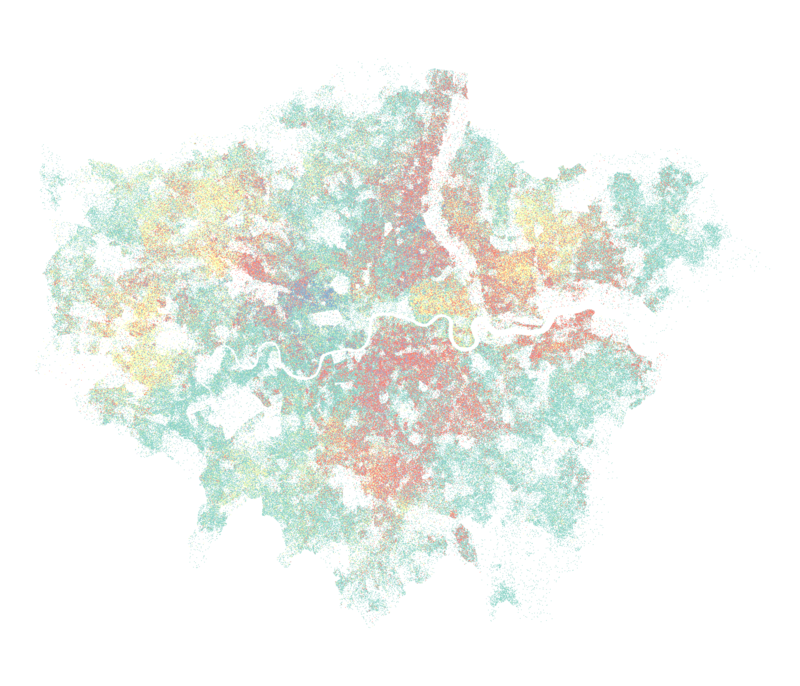 I filter each dataset to the London region but if you’re doing this yourself and want to map another region, you can simply switch London out for the region of your choice and continue on. Here we create a data frame with the number of dots we want plotted in each constituency for each party. Dividing total vote count by 100 means that each dot will represent 100 votes. We then apply a random rounding algorithm on the floats to avoid any systematic bias in overall dot counts. Then we plug this data into a purrr::map_df call and let it pipe it’s way to a nice tidy tibble with coordinates columns and a categorical column for the politcal party assignment of each dot. Finally we randomise the order of rows with slice, again to avoid any bias in plotting order. We’re now ripe for plotting with ggplot2. 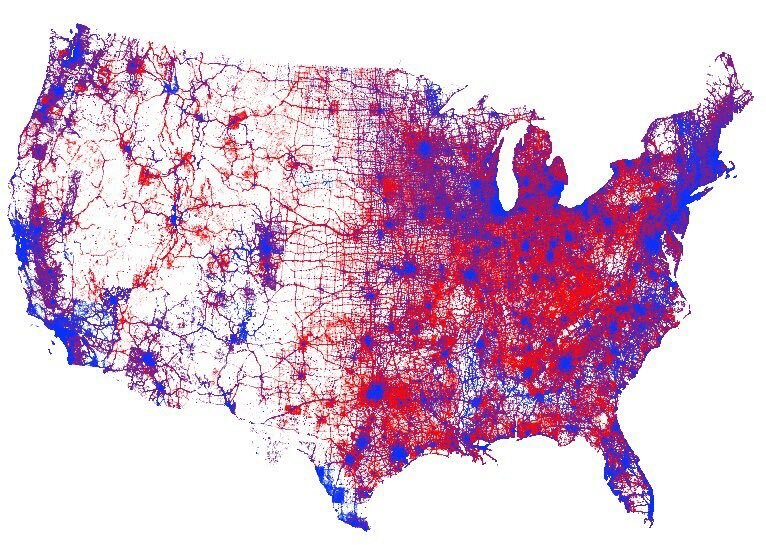 What do we think is the most insightful map? Luckily we don’t have to choose one or the other, can use both! No one map will be able to give the you all the answers so I find that it’s best to combine techniques for maximum insight. The choropleth gives us a clear indication as to who won where, and the dot-density looks under the hood and gives us an idea of the count and diversity of votes within each constituency. That’s all for now. I know I didn’t go into great detail about the code so if you have any questions or want to kick off a heated mapping debate, please do leave a comment below or catch me on twitter.